Current Location: Bintulu, Sarawak, eastern Malaysia. Distance cycled this trip: 312 km. Fluid intake: impossible to keep track. Colour of pee: bright yellow. 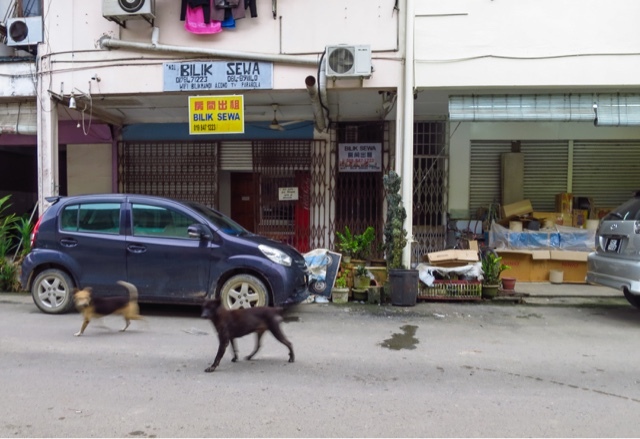 Ah, Malaysia - where the scooter riders wear their jackets back to front, roosters crow all day long, the dogs are too hot to give chase and whenever the traffic stops for long enough we hear strange stirrings in the roadside jungle. 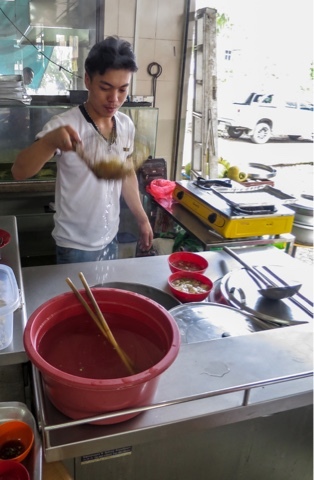 Noodle maker - Tatau, Sarawak. We have been cycling - as in proper, hot and sweaty cycle touring - for three days now and feel as though we are almost back in the groove. But I'm going to be the first to admit that it's harder than I expected. 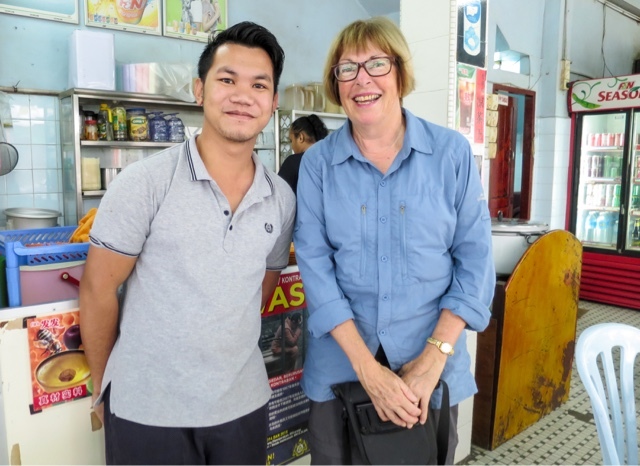 Perhaps it's to do with coming from New Zealand in winter to Sarawak where the temperature hovers in the high 20s/low 30s and the humidity is around 70%. Maybe it's the road we are on and the traffic. 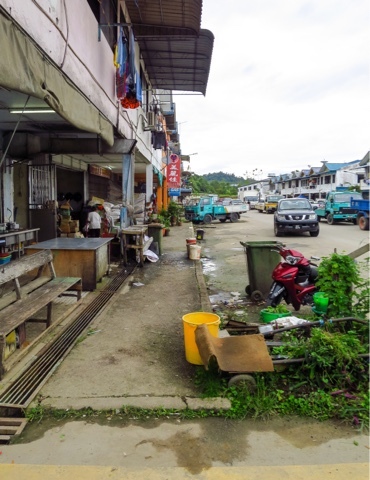 We are riding the main drag from Kuching in the southwest to Kota Kinabalu in the north east, and we are finding it irritatingly up and down - not big hills but difficult to get a rhythm going on the tandem. The road is also narrow and potholed and with dangerous edges where the sealed surface ends abruptly with drop offs of up to 30 cm to the gravel or mud below. No place to plunge in our desperation to get away from the overloaded logging trucks or the big tankers loaded with palm oil that come thundering up behind us. Having said that, most of the drivers are considerate, but they do travel fast. 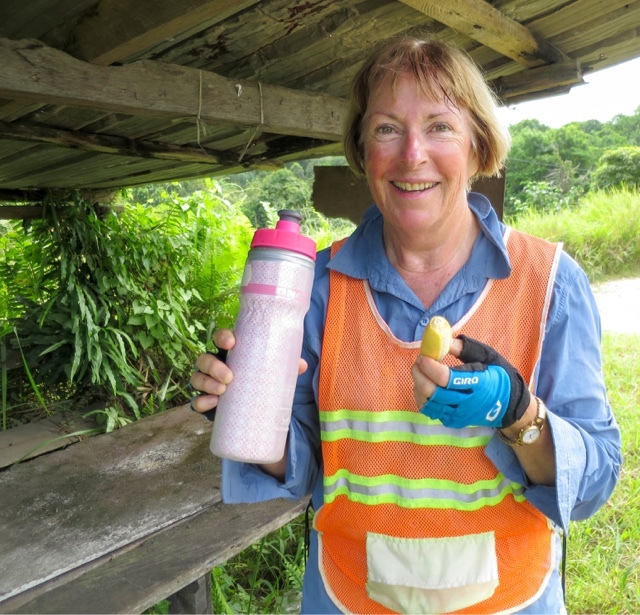 Cyclists' staples - water and bananas. The scenery has been pleasant without being outstanding - jungle with lots of km between drink and food stops. Plenty of longhouses in various states of repair, some old, timber and dilapidated but others are modern with their own fenced off balconies instead of the communal verandahs we expected. Today we saw more palm oil trees and evidence of deforestation, but so far it hasn't been as bad as we expected. The worst moment came yesterday afternoon when we topped a hill and gasping, stopped for water in a shadeless spot on the roadside. We both felt giddy when we bent down to retrieve our water bottles. Add to that, I had a tingling sensation in my fingers and feet. The last time that happened was in Bulgaria just before I ended up in hospital with heat exhaustion. We got back on the bike but we were completely knackered. Thankfully there was more downhill than uphill as we cruised the last 8 km into Tatau. The day we set off from Sibu. We had only covered 20 km when we decided to use the toilet at a service station. As usual we took it in turns, one went to the loo while the other guarded the bike, answered questions and posed for photos taken by anyone nearby with a phone. One of those who came over to chat was a tidily dressed Chinese man of about 30. As we were poised on the pedals to leave, he prised Judy's hand open and forced a MR50 note into it. Despite our protestations he wouldn't take it back. "Buy some food", he said. And today, a Muslim man stopped on the road ahead of us and tried to offer us money. He told us that because it was Ramadan he wouldn't be eating til later but with our cycling we must be hungry. This time we were ready for him and managed to decline his offer without offending anyone. Silangau. You won't find it on Trip Adviser, but we were under the mistaken belief it had a hotel and anyway there was no other town for miles around. We pedalled about looking for a sign (it didn't take long) and finally were directed to a bilak sewa - a room to rent. Full. Was there anywhere else? Yes, across the street. I went this time and sure enough there were the words bilak sewa above a door, but the owner was gruff and to the point - full, as he heaved boxes around his store. Silangau - little more than a truck stop but we were in need of a bed. Silangau appeared to be a strongly Christian town, probably Methodists. The waiter pictured with Judy is Gabriel, perhaps as in Gabriel the Angel. An elderly Chinese with a tuft of whiskers growing out of a mole on his chin joined in and led us around the corner. Another blank. Then he got on his cellphone. Yes. He walked us up the street to his friend the electrician who showed us his bilak sewa - up narrow stairs to the first floor, windowless, dingy, fan only, a rumpty bathroom. "How much?" MR50, he said. "Perfect, terima kasih." Up narrow stairs to a concrete windowless box - bliss. At a roadside stall in the middle of nowhere much. We saw chilly bins, a sure sign of cold drinks, so we stopped. On a tiny grill were some chicken wings and something suspicious on skewers. They were being carefully turned over a bed of charcoal by a petite woman who looked like Myanmar's leader Aung San Suu Kyi. We ordered some of each and posed for photos with a couple of tanker drivers who must have been slumming it. The chicken was ok, it had been marinated. After one bite Judy declared the other thing, on the sticks, was liver and was tough as old boots. She refused to eat it, then cheated and exchanged it for more chicken. Not wanting to offend, I plunged on smothering the stuff in tomato sauce and artfully flicking a large piece into the bushes as if by accident. Our hands and faces became smothered in grease. There was no water, no tissues and the sun was threatening to fry us. I didn't want to put my newly washed gloves back on. Disgusting. Judy rejected the meat on sticks and left it to me to try to maintain friendly relations at this roadside stall. Two of the men were palm oil tanker drivers and all of them had to be in the photo. So what now? We are booked into our plushest hotel yet. It's in Bintulu, a town still prospering on the natural gas reserves found offshore decades ago. It is 135 km to the next town, and there is no accommodation en route. Tomorrow we are going to check whether there is a bus with a big luggage compartment. From the aircraft window, the Sarawak River looks like a twisting serpent, all u-bends and muddy water, doubling back on itself as it meanders downstream to Kuching and the South China Sea. Imagine tilting that river out of its horizontal plane and into the vertical. It would be the perfect downhill ride on the tandem with long straights, tight curves and a road that lasts forever. As we descend to the airport, sunlight glints golden off the weirdly umbrella shaped roof of Sarawak's new State Assembly building, we see a jumble of shop houses crammed near the waterfront and then suddenly what looks like mangroves as we skim low over the water. Assembling the tandem in the air conditioned comfort of the terminal at Kuching airport. Sarawak may be one of Malaysia's Federated States, but for some inexplicable reason visitors - "foreigners" as the sign says - still have to go through immigration even if they have already entered Malaysia somewhere else. We get new stamps in our passports and push our boxed-up tandem on a trolley out into the airport terminal's public area. We find a quiet spot tucked fairly well out of sight between an escalator and a glass exterior wall, and spend the next couple of hours putting the bike together and repacking our panniers. Throughout the process we are watched by a man outside, he never takes his eyes off us. Towards the end, we are joined by two neatly dressed middle aged men who want to know what we are up to. Tentatively one asks what we are going to do with our now discarded bike boxes, and before we know it he and the boxes have gone. To what purpose we have not a clue. We step outside into the afternoon heat but somehow the 10 km ride into town is not as bad as we feared. The moment we start cycling we create our own breeze. We wobble a bit. We are out of practice but know it will get better in the days ahead. 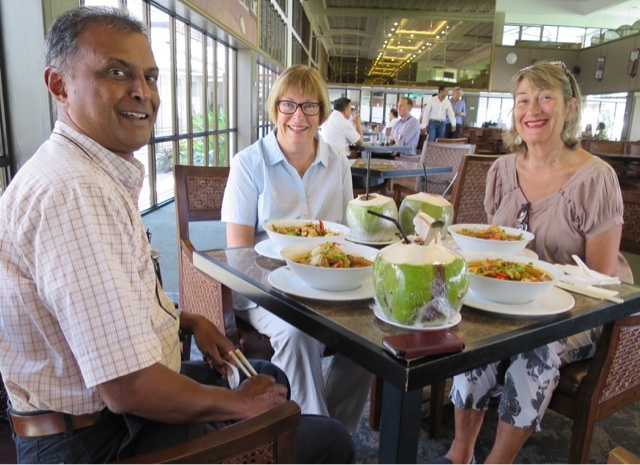 Lunching at the Royal Selangor Golf Course, Kuala Lumpur. On the left Suku, Judy centre and Annabel right. The surroundings were superb, and for golfers there are two 18-hole courses. If that doesn't provide enough exercise, there is always the Olympic size pool and at least two smaller ones. 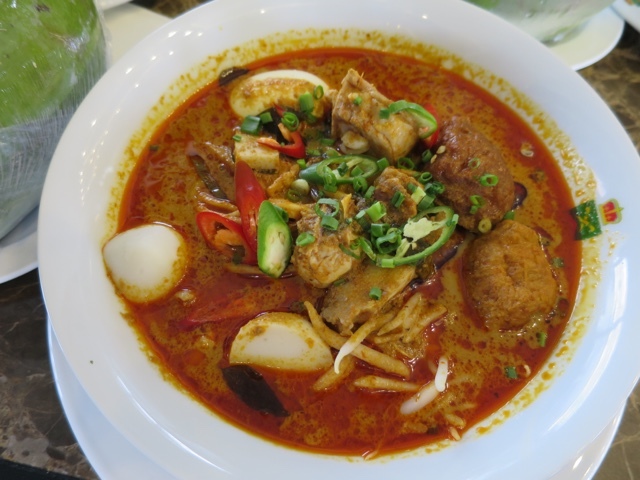 Curry laksa with a chilled coconut each. Who wants to go cycling? We have a plan, of sorts. As always it's a bit loose, but that's cycling. We figure on a few days here in Kuching, then we will start pedalling our way north east up to Brunei and into Sabah - a distance of around 1,200 km. From Kota Kinabalu, Sabah's state capital, we will fly back to mainland Malaysia and cycle the east coast. Our first full day in Kuching has seen us on a mission - a small, pleasant one. Our Kuala Lumpur friends, Suku and Annabel, are in the business of importing gorgeously beautiful textiles, rugs and furniture from exotic places - particularly India and Turkey. 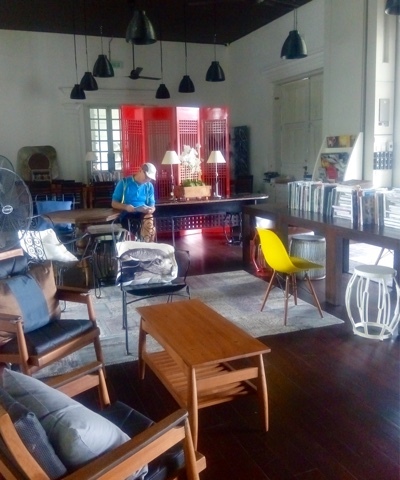 Some of these items have been snapped up to refurbish Kuching's old courthouse which is being redeveloped as a tourism complex with a bar, restaurant and reading room. 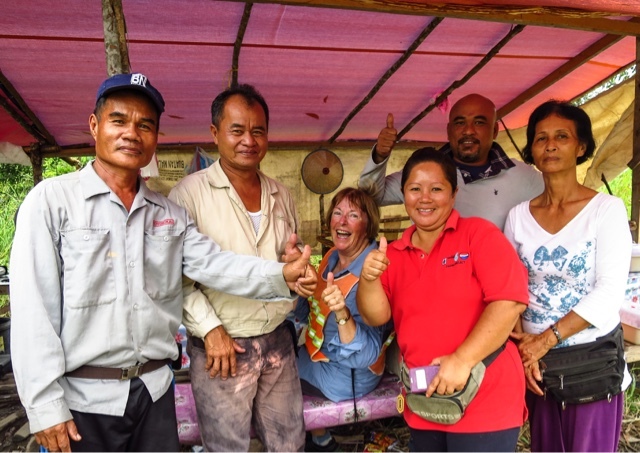 An Australian businesswoman called Narelle is behind the ambitious project. She is a friend of our friends, and our mission is to report back on progress. "You must go and have a look," Annabel told Judy. Kuching's old courthouse - refurbished and turned into a smart tourist centre. We spy furniture from our friends - the rug and the white stool and much more out of shot. So we do. Unfortunately Narelle is nowhere to be seen. She is on Langkawi Island, no doubt attending to another business enterprise she has there. However, the staff say we are welcome to take photos. Judy pulls out her phone and busies herself taking pictures while I just enjoy the air conditioned cool. We relax with English breakfast tea and cake, then stroll up the road to the Sarawak Museum to pore over the exhibits of very dead snakes, orang utans and proboscis monkeys. We have no desire to encounter live snakes during the ride ahead, but would love to come across some monkeys and who knows, we might even see a real live orang utan.